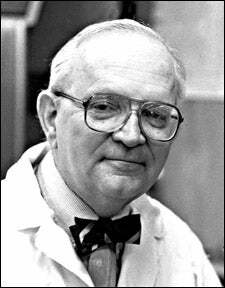 Harvard lost one of its greatest teachers and quintessential biologists with the death of Claude Alvin Villee Jr. on August 7, 2003, at age 86, after a long illness with Parkinson’s disease. Claude came early to the revolution in the science of reproduction and equality of women at the Harvard Medical School. Claude made a huge contribution to this quiet revolution. Claude’s scientific bridge-building is illustrated by his vision to promote interdisciplinary interactions. Born in Lancaster, Pennsylvania, in 1917, Claude Villee graduated from Franklin and Marshall College in 1937, and earned a doctoral degree in genetics and physiology from the University of California, Berkeley, in 1941. His teaching career spanned 5 decades, beginning with the years from 1941 as a research associate in Zoology at Berkeley and an assistant professor at the University of North Carolina. His Harvard years spanned from 1946 until his retirement as Andelot Professor of Biological Chemistry in 1991. It was during his North Carolina years that an editor from Saunders asked if Claude would write a textbook of biology. The rest is history; eight editions followed. His textbook has been translated into Russian, Chinese, Polish, French, Spanish and Italian, according to his wife, Dr. Dorothy Villee, who is a pediatric endocrinologist now living in Falmouth, Massachusetts. She reminded us that Claude headed the tutorial for medical students from 1964 until he retired in 1991. He also chaired the Committee on Honors in a Special Field throughout his tenure at Harvard. Claude’s Harvard years were also noteworthy for the production of 350 original publications, often with individuals from other disciplines. The late Dwain Hagerman, for example, was a biochemist and colleague of Claude. Among his many studies were changes in hormonal synthesis throughout human development in the human fetal liver, and the effect of adrenal hormones on metabolic pathways. His studies on steroidgenesis were pioneering and led him to the concept of the placenta as a neglected experimental animal. Claude came early to the revolution in the science of reproduction and equality of women at the Harvard Medical School. Claude made a huge contribution to this quiet revolution. Claude’s scientific bridge-building is illustrated by his vision to promote interdisciplinary interactions. Among his colleagues were Drs. Charles Roby, C. Sidney Burwell, James Metcalf, Clement Smith, Duncan Reid, John Enders, Somers Sturgis and Everett Anderson. None was more significant in the collaboration than his wife of fifty years, the pediatric endocrinologist, Dr. Dorothy Villee. It was Claude’s initiative to establish a building to house the members of many disciplines. With the help of Duncan Reid and Deans Burwell and Berry, Claude raised the funds that launched the Laboratory of Human Reproduction and Reproductive Biology (LHRRB), an advance that supported more than fifty fellows during his tenure. Claude’s lesser-known talent was his love of music. While in college, he had a dance band, made possible by his “perfect pitch” that enabled him to play clarinet, saxophone, flute, and violin. He even was the singer for the band. He also enjoyed sailing, even while conducting research at the Marine Biological Building in Woods Hole. It was there that he met Eric Ball, who invited him to join the faculty at Harvard, and formed the basis of a long friendship. His wife, Dorothy, and children Suzanne Lloyd, Claude, Stephen, and Charles, together with three grandchildren, as well as innumerable colleagues, are grateful for his life.